If you are a visitor to Idaho - home of gentle rolling hills, plan a unique ghost-hunting adventure and stay at one of Idaho's haunted hotels. And if you are a resident of Idaho, get to know your state's spookier side and embark on an exploration of the unexplainable and visit one of Idaho's very own haunted hotels. One of its most haunted hotel is the Owyhee Plaza Hotel in Boise. 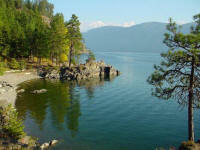 This hotel could possible leave you running from gentle Idaho and its hills. No, not THE Bates Motel from Psycho. 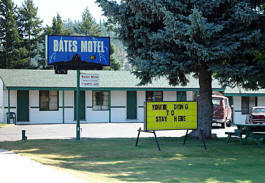 It's the other Bates Motel....in Idaho! Come on, where've you been?? Before it became a motel with the infamous name, it was an officer quarters at the Farragut Naval Base. It is said that most of the rooms have some level ghostly activity. However, rooms #1 and #3 seem to be most busy with spirits. Guests generally experience "creepy feelings" in these two rooms, but there has been no dangerous activity. There have been incidences of ashtrays falling off tables, lights flickering on and off and items left on tables changing positions. 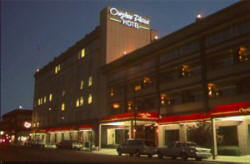 The Owyhee Plaza Hotel is located in picturesque downtown Boise. 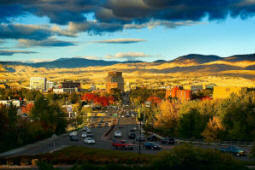 Boise, known as the “City of Trees”, seems like the idyllic place to live: rolling hills, clean air, and of course, lovely trees. This pristine and quaint “little” town also has a wonderful little secret: Ghosts at the Owyhee Plaza Hotel. There have been reports from both guests and staff that ghosts reside at the Owyhee Plaza. Some activity includes full apparitions and spiritual energy. So after hearing about the Owyhee Plaza, we contacted the general manager, John May who was so kind to give us a rundown of the Owyhee.